Want to buy a pet boy? Go to the slave dealer and ask if they have any Egyptians in the back. Don’t want to dirty your hands punishing your slaves? Hire a contractor, who will provide floggings, hot pitch for torture sessions and a crucifixion service, even providing his own cross and nails, all for modest fees. Need to know what to feed your slaves that will cost the least and provide the most in return? Try a diet of rough bread, salt, grapes, olive oil, olive mash and dried fruit. 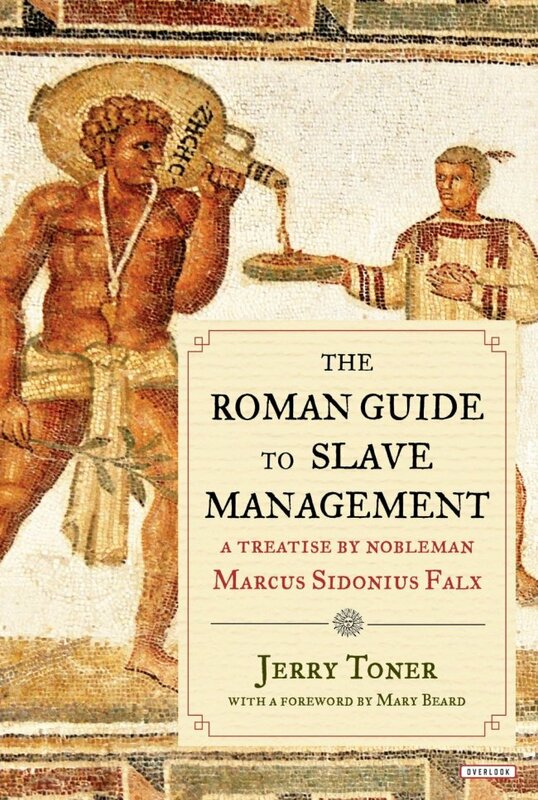 “The Roman Guide to Slave Management: A Treatise by Nobleman Marcus Sidonius Falx” by Jerry Toner gives as complete a picture as we have of the indignities and cruelties of slavery in ancient Rome. It is presented as an advice manual by fictional Roman nobleman Marcus Sidonius Falx. Falx sees nothing wrong with his treatment of his slaves, viewing himself as a stern but fair master. Author Jerry Toner cleverly reveals the painful reality. All is best summarized in an anecdote toward the start of the book, in which a slave smirks when Falx gets hit in the shin with a hoe. “This slave thinks that injuries to the leg are amusing. Let us break his legs and see how much he laughs,” Falx says. Falx then goes on to explain how to exploit one’s slaves to the maximum while viewing oneself as virtuous. Commentaries at the end of each chapter explain the historical sources for Falx’s various statements. The narrative sags a bit toward the end, in which the character of Fax is not so sharply or amusingly drawn. Still, a frightening picture of the Roman master emerges. He is dedicated to his own power, wealth and amusement, caring less than nothing for slaves’ feelings not to mention health or well-being. On beating slaves with one’s own hand, Falx advises caution ― not that the slave not be maimed but that the master not accidentally bruise himself. Falx clucks his tongue at the way some of his friends punish their slaves, such as beating one with rods for coughing while serving soup. Falx doesn’t mind the slaves suffering beatings; he minds his own relaxation being disturbed.